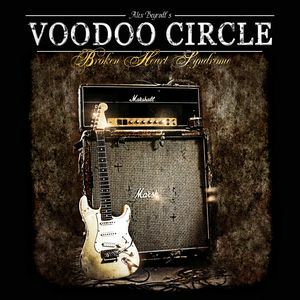 Voodoo Circle are the stunning hard rock band from guitarist Alex Beyrodt (Silent Force). The band are just about to release their fantastic second album ‘Broken Heart Syndrome’ on AFM Records and we caught up with the bands mainman to discuss the making of the new release, his gear preferences and the outlook on Silent Force. Alex, many thanks for speaking to us again.The second Voodoo Circle album ‘Broken Heart Syndrome’ is about to see release. We gave it a glowing recommendation, how has it been going down elsewhere? So far I received almost only very good reviews. Only one or two silly ones…with comments like “the band tries to impress with Spanish guitars and ZZ Top riffs”….I will never understand some of those Internet mags and self proclaimed “Journalists”…sorry! I’m even more thankful for mags like yours, were people have knowledge! When did writing for the record commence? Oh, I write constantly. It is hard to tell, but I probably started 2 years ago. Do you normally write a big batch of songs and pick the best, or have little riffs and melodies you piece together when in the studio? I usually write and record the song in my studio. I always have around 20 songs ready. In fact we could easily record another Voodoo Circle album tomorrow. How closely do you work with the rest of the band when writing? Well, I always compose the music, then we decide which songs have the best feel and spirit. Then David visits me and we work together on the vocal melodies. After that we have another vote, we make an A and B list……A goes on the record, B will be redone in the future. Is most of this work done in your home studio? The writing process is done in my studio, yes. The rest we do in different studios. It is important to me to have good rooms, especially when recording the drums. Whereas I felt there was a more nod to Malmsteen on the debut the new album sees a lot more Blackmore, is that a fair assessment? Absolutely, on the new album I go way way back to my roots….and I enjoy it a lot. I am a melodic player, always have been. I love to play with a lot of feeling and also to let the music breath. In fact, Yngwie and me, we have the same roots….I scalloped my Strat by myself when I was 16, so did Yngwie…..I grew up with Purple, so did he. And, I am very proud to let you know that I just got back from touring with the “Rock meets Classic” show were I played 3 weeks every night with Ian Gillan…..a Best of Purple Set. That was a real highlight. Your guitar tones also feel a little more vintage as well, was this intentional? I wanted to have the right sound for those songs, so ..yes…intentional. We are loving the tones you are coaxing out of your Strats. It sounds like a very stripped down approach; can you tell us what gear you used this time around? I used a Marshall 1987X, a Voodoo Amp, my famous GuitarSlinger Double Dealer Booster and Overdrive (www.guitarslingereffects.com) and around 5 different Strats. Effects: GuitarSlinger Effects Double Dealer & Fireball, WEM Copycat Echo Unit, Jim Dunlop Cry Baby Wah Pedal, Jim Dunlop Uni Vibe, Boss OC3, not to forget: Rübli Rock Alex Beyrodt Custom Picks & Live Line Cables. How were the amps mic’d up? Was there one particular piece of gear that you really connected with this time round? My 72 Strat is the main guitar on the record. David Readmans’ vocals are again superb. He sounds like he has chosen a darker tone this time around with some smokey Coverdale-isms. How did the pair of you work on the vocals, melodies, lyrics etc? Was there any particular vibe you were shooting for this time? Do you have any favourite tracks/performances on the new album? I think I have never recorded a better rhythm guitar then on “Blind Man”. It has a very bluesy, Hendrix-ish vibe and this is a side of me not many people know. I love Power Blues, have you heard Philip Sayce…..I love him! I know you were looking to get out on the road with the last release, can you see that happening this time round? Well, we have been touring for around a week after the first release. We are recently looking for a tour to hop on….as 120 other bands too. Any videos lined up at all to promote the release? We released a promotion clip with interviews. What else is in store in 2011 for Voodoo Circle? Are Silent Force over? On hiatus or what? It’s been ages since we’ve heard anything, is there likely to be any activity there down the line? Well, DC is back in Royal Hunt, I am a constant member of Primal Fear, Voodoo Circle, plus I have my own effect pedal brand www.guitarslingereffects.com, Andre is drummer in Rage…we are all very busy. I am not saying we will never record another album but right now it has no priority….plus….let’s say….there are still some internal issues which have to be resolved first. Rock’ Roll isn’t a rocking chair!!! This entry was posted in Interviews and tagged AFM Records, Alex Beyrodt, Broken Heart Syndrome, Interview, Primal Fear, Silent Force, Voodoo Circle. Bookmark the permalink. When they are not delivering Teutonic metal during their day job, Alex Beyrodt and Matt Sinner like to relax with classic 70s rock. Voodoo Circle’s debut was an impressive calling card for everyone who likes Deep Purple inspired hard rock. No big changes for the follow up. “Absolution Blues” kicks off proceedings in true vintage Whitesnake style. The opening riff to “King Of Your Dreams” owes more than a little to Purple’s “Perfect Strangers” but takes a twist towards Dougie White era Rainbow once it gets going. “Devil’s Daughter” references Purple Mk3 while “Blind Man” takes a more bluesy approach and hints at early Rainbow balladry.I think you get the gist of it. Purple, Rainbow and Whitesnake are the main inspirations here. I don’t think anyone does this style of music better than Voodoo Circle at this point in time. The songs stand strong with a solid foundation of skilled musicians. There’s no overplaying, there’s no filler. Beyrodt is a killer guitarist. Tasty, technical and melodic. The whole album is an example of great Strat tones. Yngwie, are you listening? There’s more of a Coverdale influence in the vocals (“Don’t Take My Heart” for instance) than first time around. You won’t hear me complain… David Readman does an exceptional job. Highly recommended for all lovers of old school hard rock. This entry was posted in Reviews and tagged AFM Records, Broken Heart Syndrome, David Coverdale, Deep Purple, Voodoo Circle, Whitesnake. Bookmark the permalink.